Spyder Kids Size Chart Add some style to your snowy stride with the Posh Faux Fur Jacket. HydroWEB™2.0 20k/20k laminate provides waterproof, breathable protection. Spylon+™ DWR (durable water repellent) finish repels moisture and protects against water- and oil-based stains. Critically taped seams keep water out of key areas. Thinsulate™ insulation (120g) utilizes fine fibers that form a tight collection of air pockets. These pockets trap body heat while allowing moisture vapor to escape. Fixed hood sports removable faux fur trim. Full-zip front with interior wind flap and hook-and-loop closure at neck. Long sleeves sport hook-and-loop adjustable cuffs. Gaiters with thumb loops keep sleeves extended and hands warmer. Interior hook-and-loop and mesh goggle pockets. Zip chest, hand, and left forearm pass pockets. Adjustable powder skirt features an elastic gripper. Slight droptail hem. 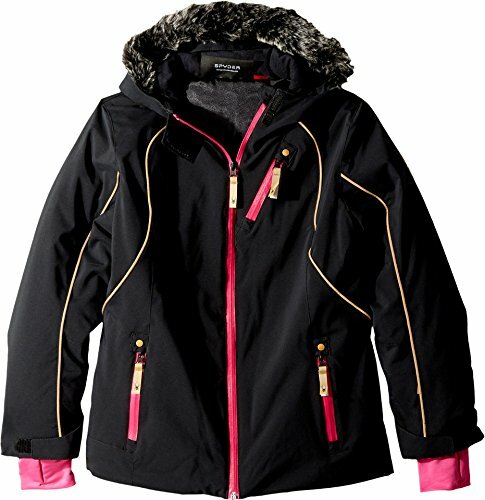 Shell: 100% polyester.Lining: 100% nylon.Faux Fur: 84% acrylic, 16% polyester. Machine wash, tumble dry. Imported. Measurements: Length: 22 1⁄4 in Product measurements were taken using size 14 Big Kids. Please note that measurements may vary by size. Add some style to your snowy stride with the Posh Faux Fur Jacket. HydroWEB™2.0 20k/20k laminate provides waterproof, breathable protection. Spylon+™ DWR (durable water repellent) finish repels moisture and protects against water- and oil-based stains.